Nestled on a wooded lot behind a Victorian “painted lady” on a busy street in the DePaul neighborhood, this coach house built in two parts in the 1880s had been languishing under a leak prone flat roof and T-111 plywood skin since the 1970s. 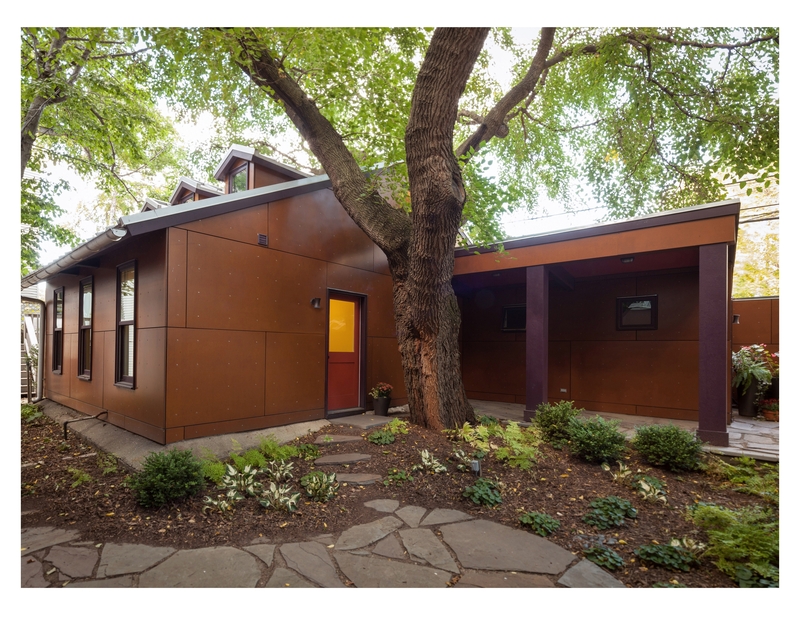 Dark and underutilized, it housed a barely usable garage and an uninviting apartment used mainly for storage. 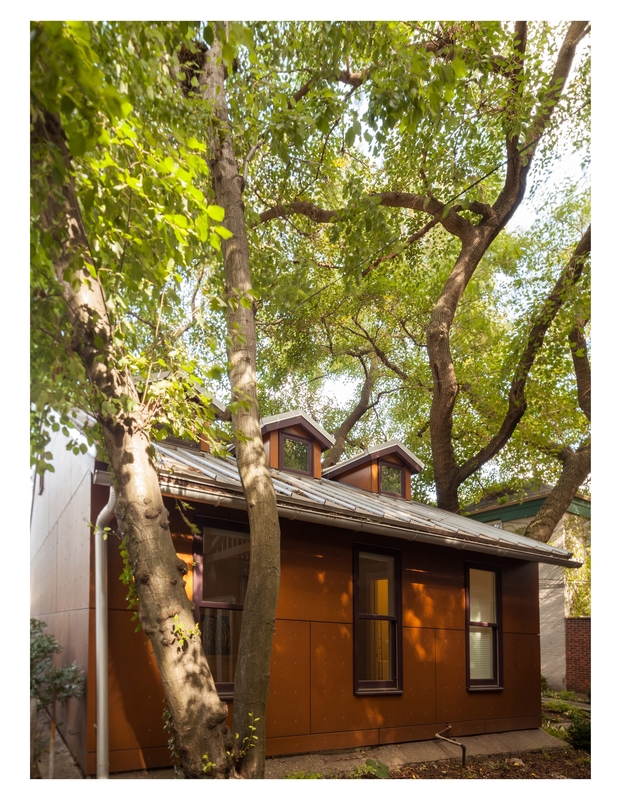 The owners asked for a light and compact space for guests, a two car garage, an easily accessible storage space, and improved connection between the coach house and the backyard: all while retaining the original foundations and working around a beloved and enormous tree. 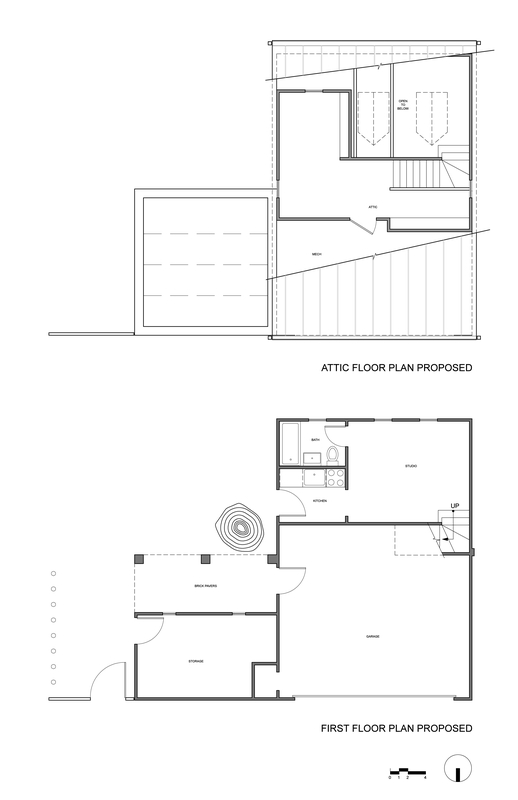 By inserting trusses and raising the roof on the west half, to just under the curving trunk, the space was opened up to accommodate a larger garage and an apartment with a sun dappled loft lit and naturally ventilated by new operable dormer windows. Retaining, but sheathing, the original post and beam structure on the east half, the exterior wall is pulled back under the roof to create a covered porch facing the yard. The building’s rain screen siding, constructed of environmentally friendly resin impregnated signboard which is left its natural color and further sealed to protect the surface finish, provides a compatible backdrop to the surrounding trees and plants. While the bold purple and red of the trim accentuates points of human contact such as doors, windows, and porch columns and creates a dialogue with the main house. Materials from the existing building such as wood floors were salvaged and re-used. 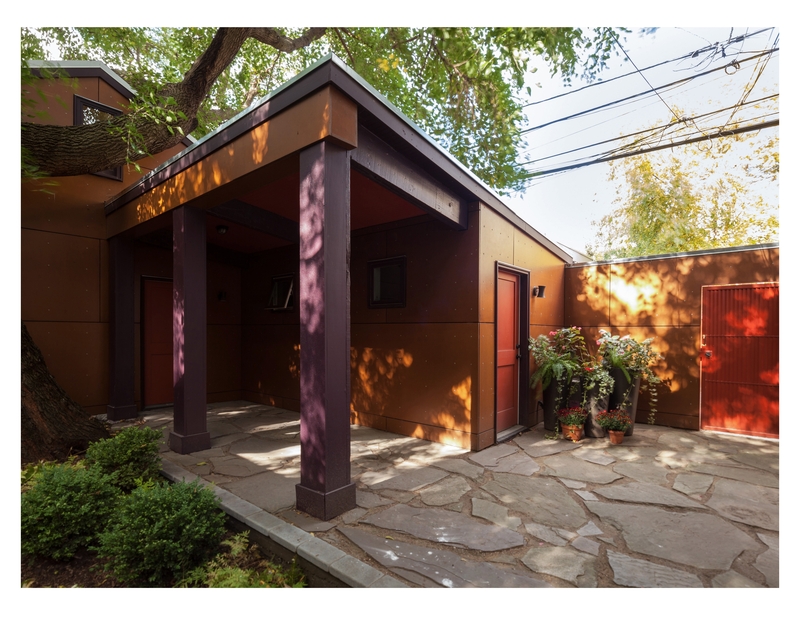 A standing seam metal roof and galvanized half round gutters speak to durability and urbanity while the alley wall was extended and punctuated with a slatted metal gate for privacy. An atmosphere of leafy relaxation, so rare in the city, now prevails.